The company Kochen & Kunst was founded by Alex & Angkana Neumayer in 2004 to offer further education in the area of culinary art (edible art) as well as various Asian cuisines. Kochen & Kunst quickly established itself in this market, and the demand for courses and workshops came from different countries of Europe. In 2006, the Kochen & Kunst Shop, founded as a specialist shop, offered our customers high-quality, interesting appliances for kitchen, art & culinary artistry. Angkana is a native of Thailand. 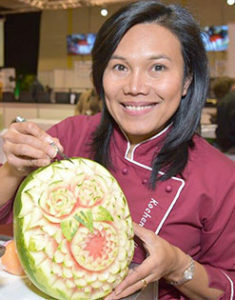 After completing her bachelor's degree, she learned the art of fruit & vegetable carving in her home country. Her culinary development included further education in Thai cuisine, Vietnamese cuisine and sushi production. Alex Neumayer from Salzburger Gasteinertal was 9 years in Southeast Asia as an executive chef in the 5 star hotel Industry. The two are specialized in several Asian cuisines, excellent experts in fruit and vegetable carving, masters of ice sculptures and chocolate carving as well as sushi experts. They won gold medals for their culinary art at the biggest international competitions, among others. Four times at the Culinary Olympics. Alex & Angkana share their knowledge about the different Asian cuisines as well as culinary artistry in courses and seminars - whether for chefs from hotels, hobby cooks or gourmet friends. In 2009, Alex & Angkana received the "Gourmand Cookbook Award" for their guide book „Table Decorations from Fruit and Vegetables“. In 2011 their second book-project „Kunstvolles Seifenschnitzen“ followed. 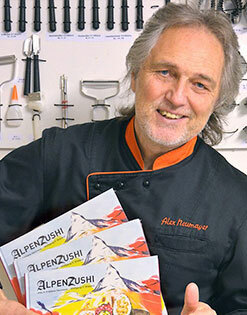 At the end of 2016, the book „AlpenZushi“ came, after the sushi compositions by Alex & Angkana became more and more popular with guests and workshop participants. Alex & Angkana give courses and workshops in several countries. They are active as jurors and co-organizers at international cooking events, enriching with their carving, cooking demonstrations so many events.